This title is a pun on "court" and "yard." 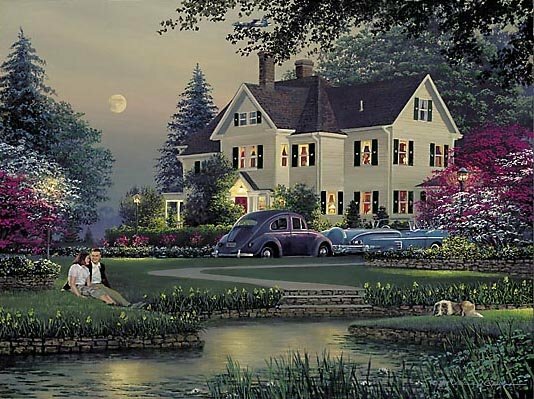 The warm, late spring evening and full moon should put the young courting couple in a romantic mood but they don't have all the privacy they would like. Look up at one of the house's second story windows - you'll find a woman looking out, keeping an eye on them! This 1950s era scene is a "follow on" to "Evening Star" which also focused on romance and nostalgia. The Volkswagen Beetle parked in the driveway dates to the 1950s and the convertible is a 1958 Chevrolet Impala. High in the sky is one of yesteryear's aircraft, a Navy P2V.